I have always been one who looks at a recipe and can envision how to make it “MJ friendly” or my own based on personal preference. I subscribe to the magazine Cooking Light and immediately crack it open when it comes in. This nut-free recipe was adapted from the March 2014 Issue to be dairy, soy, and gluten free (and with less sugar than the original version). Sabrina is also tinkering with a version of this to be egg free as well so check back for updates. Combine oil(s), margarine and chocolate in a glass bowl on top of a simmering pot of water, or in a double boiler if you have one (I used the glass bowl). Melt chocolate stirring often, be careful not to let the water underneath boil too much (or it will toast the oil more which can have a bit of a burnt taste). 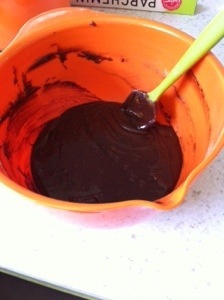 Pour chocolate mixture into a bowl, add cane sugar and stir with a whisk until combined. Add 2 of the 3 eggs and stir again. Add in vanilla and salt. Fold in flour, one type at a time. Add flax. Stir. Your batter will be pretty thick – that’s ok. Line a square (not glass) baking pan with parchment paper and lightly coat/brush the sides in oil to further prevent sticking. Pour batter into pan. In a small bowl, combine your remaining ingredients – egg, turbinado sugar (brown sugar) and tahini. Stir until well mixed. Drop vari ous size teaspoonfuls of mixture into batter – doesn’t need to be pretty. 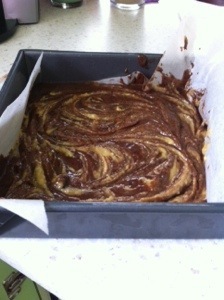 Once done, swirl with a knife until you have a marbled effect. Bake in the oven for 20-25 minutes (or until a toothpick inserted comes clean) at 350 degrees. Cool for 20-30 minutes then remove to a wire rack for further cooling. Sabrina – I first tried these yummy brownies at Rebecca’s and we all instantly fell in love with the flavours that the combination of sesame and chocolate bring. They were delicious. We had recently made the decision to remove eggs from the Monkey’s diet, as they are a common allergen, to see if he reacts to them so I wanted to make these egg free as well. 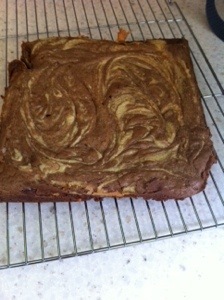 My first attempt, although still delicious, were a bit flat and much fudgier then the ones we had sampled at Rebecca’s. I couldn’t simply sub a 2 flax eggs for the 2 real eggs in the recipe. Even though they were still delicious the first time I wasn’t completely satisfied. I decided that I would play with the proportions of the flours in the next batch so I increased the buckwheat flour, added more flax meal, added 1/2 a tsp of baking powder to give it rise and also used 3 flax eggs instead of 2. These new proportions delivered a perfect brownie which had an almost identical texture to the egg version that Rebecca had originally made. So below is my version of these delicious sesame brownies. I first mixed together my flax meal and water, set aside. Preheated my oven to 350 and greased a 9×9 Pyrex dish with coconut oil. I then measured out my dry ingredients – buckwheat, oat, flax meal, baking powder and salt. Stir well and set this aside. Combine oil, tahini, chocolate, and vanilla in a glass bowl on top of a simmering pot of water, or in a double boiler if you have one (I used the glass bowl). Stir constantly. To make sure not to burn the delicate chocolate once my pot is simmering I remove it from burner before placing my glass bowl over top. Once my chocolate and oils were melted I added my wet flax meal and sugar to the mixture and stirred well. I then poured my wet into the center of my dry and stirred until everything was nicely incorporated. The batter will be very thick. 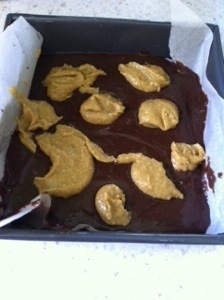 Next pour the batter into your greased pan and using the the back of my baking spatula I spread the batter out evenly. 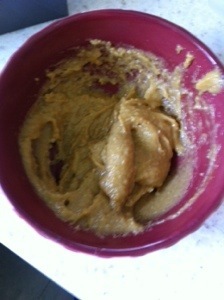 Mix together the 1/4 cup of tahini with the maple syrup. I dropped this in small batches all over the tip of the batter and then swirled it around to distribute evenly. This allows the brownie to bake more evenly otherwise I found the tahini mixture would fall through the dough and those sections would not cook fully. Place in the oven for 20 – 30 minutes until a toothpick inserted in the center comes out clean. Do not over bake these or they will be dry. Now you are probably wondering why are our directions also completely different and the truth is I am lazy. It was quicker to mix the flours together and then simply add the chocolate mixture to it. So either of our directions should work for whichever recipe you choose to make.